It's been what feels like forever since I've seen an awesome neon collection, but Celestial are here with the goods! 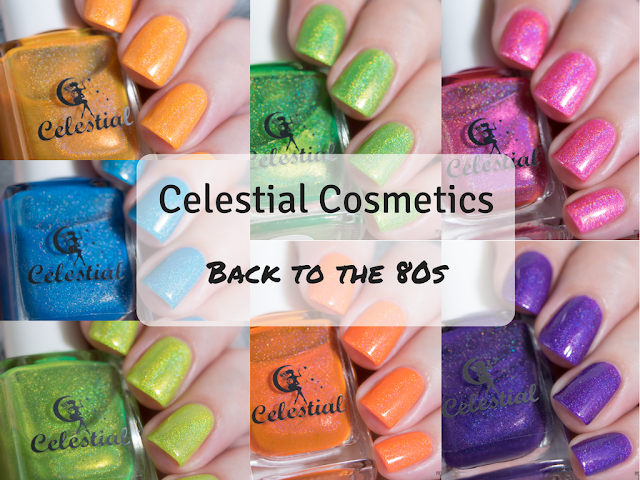 Kick off 2018 by rewinding 30+ years back to the glorious 1980s, the decade of my birth and era of colour and excess, with this awesome mix of bright neon holo jellies. Bright, in your face neon orange, a nice balanced tone. 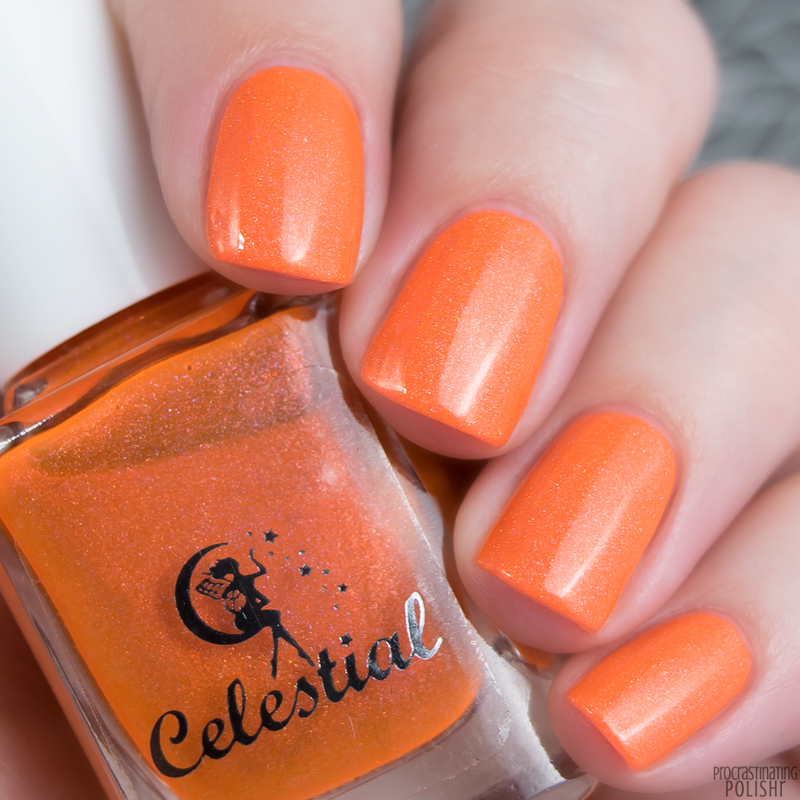 The polish was created using a red pigment, and the addition of the scattered holo changed the finish to this stunning orange. There's a subtle linear holo and a pinkish shimmer - presumably a remnant of the red pigment used to create it. It has a gorgeous formula, smooth and easy to apply and self levels beautifully. All the polishes in this collection appear sheer on the first coat but build beautifully - this one was opaque in 3 thin coats. 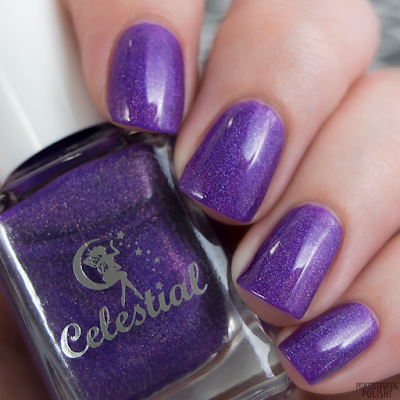 I used Celestials Light Year top coat to add shine as neons are know to dry with a bit of a matte or satin finish. 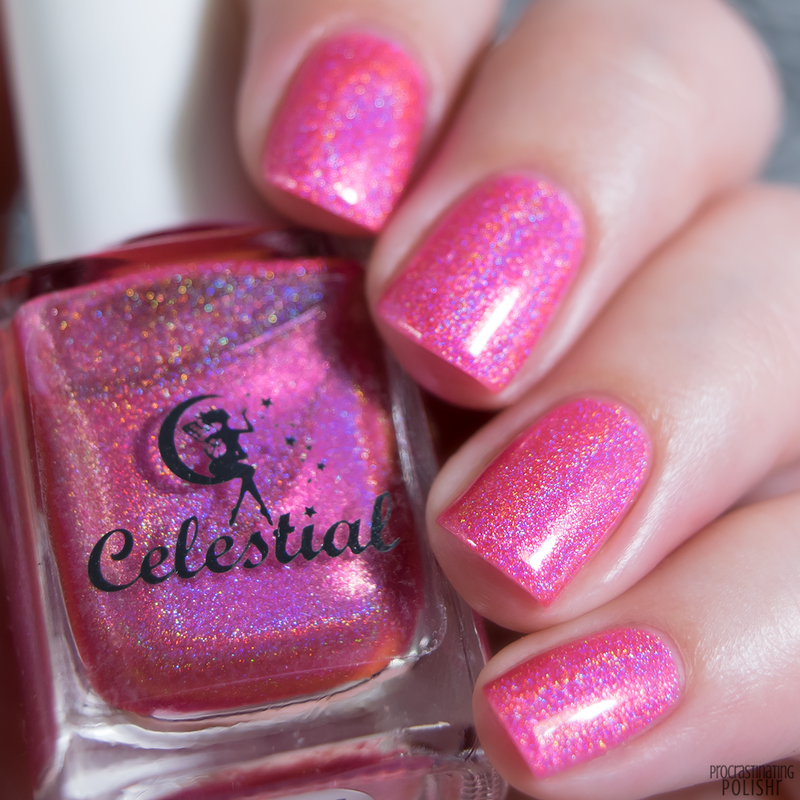 Bright barbie pink with a linear holo rainbow - maybe not super neon but it's mega bright! Such a great vibrant colour. 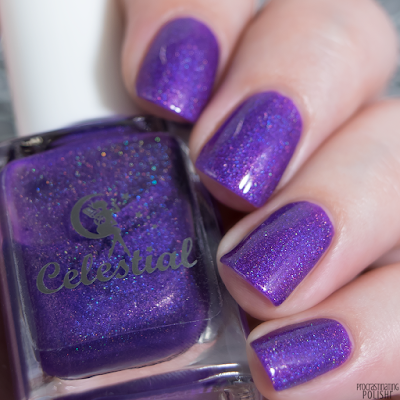 It appears to have a slight purple shimmer but that might be a trick of the holo? I'm not a pink person but I am very pro-obnoxiously bright colours so I'm totally on board with this. The formula is excellent, essentially the same as Atari Adventure. 3 thin coats for perfect opacity and topped with Light Year top coat. A light, bright blue that sits somewhere on the spectrum between sky blue and cerulean. It's loaded with a scattered holo that has a distinct silvery edge that makes for a slightly different finish to the rest of the collection. This one looks a little darker in the bottle and I wish that had translated to my nails, I'd have liked just a touch more oomph. Again though with the gorgeous formula! I don't have much to say that I haven't already. 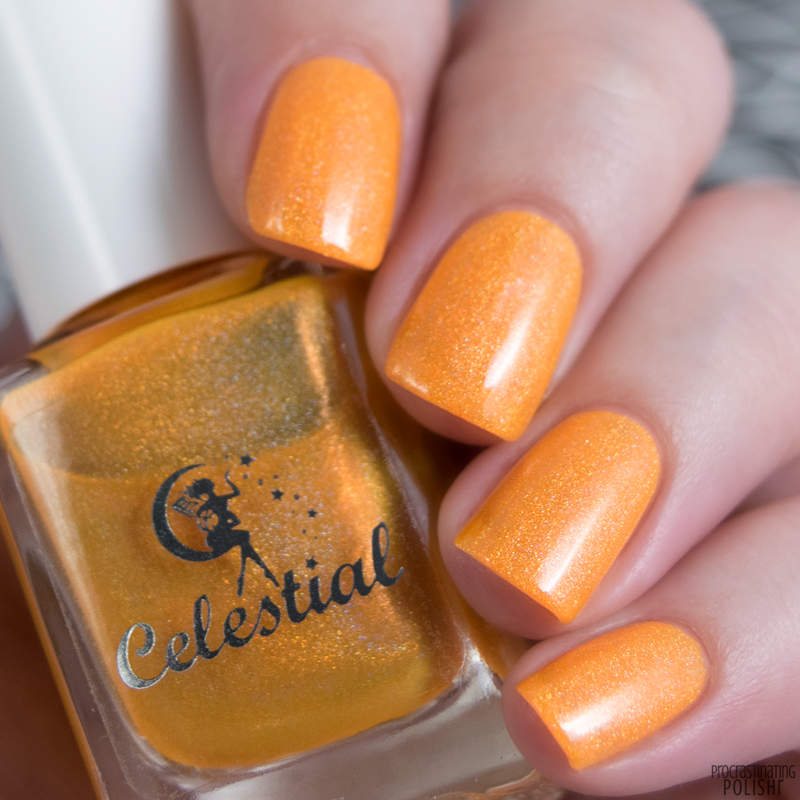 3 coats for a nice solid opacity, and topped with Light Year top coat. 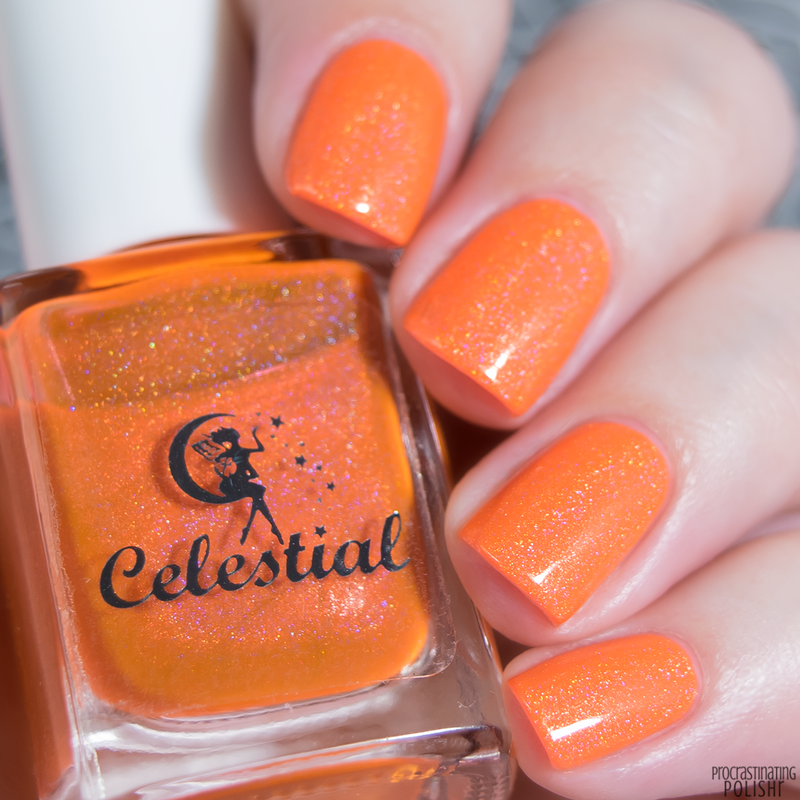 Neon mandarin with a holo finish that's somewhere between linear and scattered. 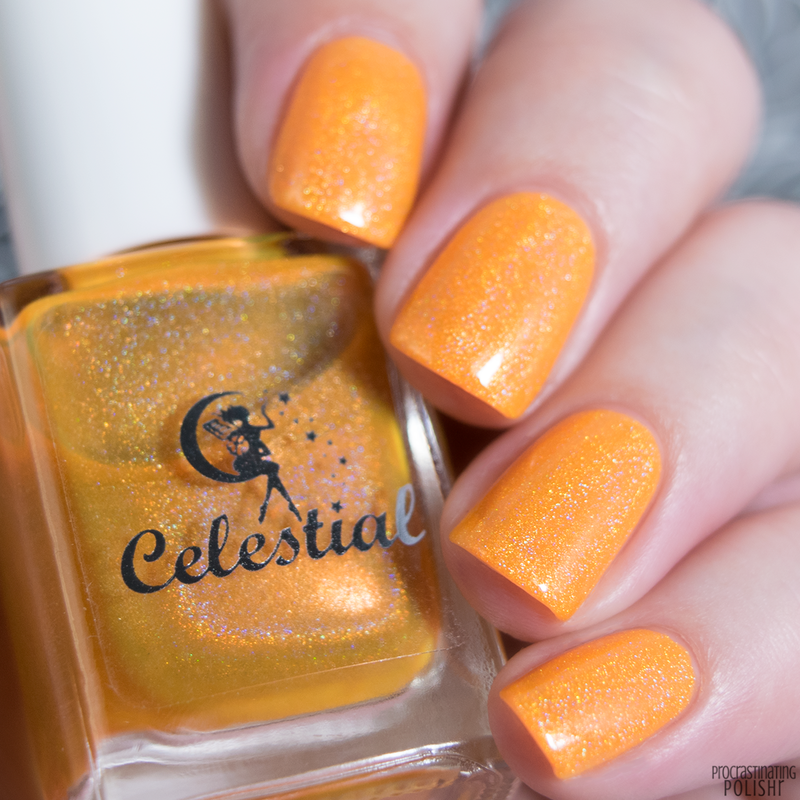 I am already completely obsessed with this shade, it reminds me of an old China Glaze I once loved (Sun Worshipper) but with bonus holo. I don't know if it's me projecting my own desires but I feel like this has the slightest tinge of mustard? Whatever it is, it's RIGHT. This again has a gorgeous formula, beautiful to apply though a touch sheerer than the first few. I still had the slightest hint of VNL with 3 coats, but I don't know if I'd have noticed it away from my bright photography lights. An electric neon purple with scattered/linear holo. This one is super glowy, a darker shade that's still super bright. The holo reflects lots of blue and pink tones that make for a really cool finish that messed with my camera a little. This one has a slightly thicker formula than the rest - still just as easy to apply though. 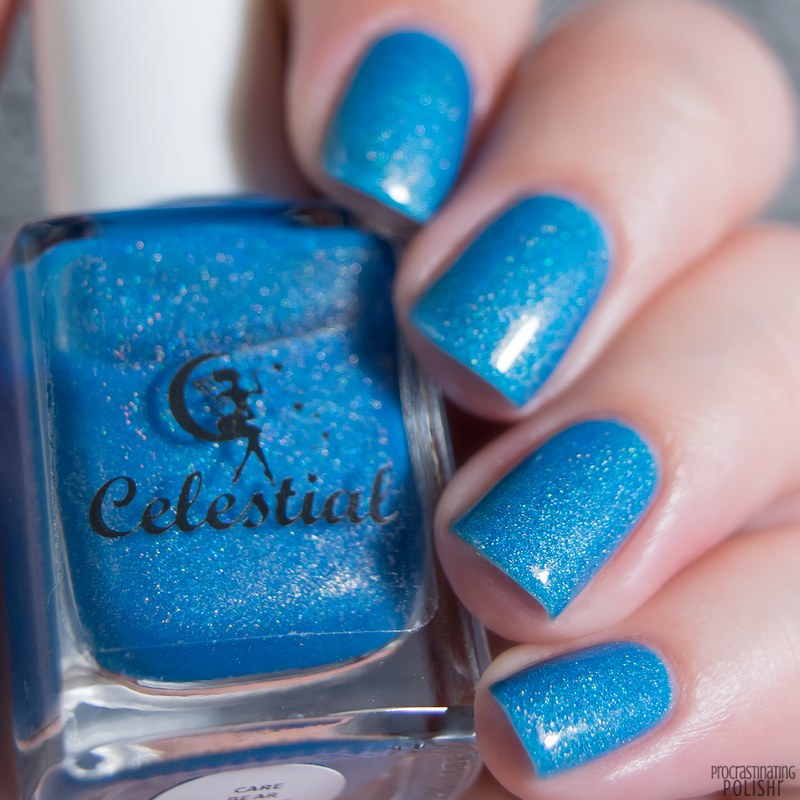 It's really well pigmented and I only needed two coats for opacity. Neon chartreuse with a generous linear holo rainbow. HECK. YESSSSS!!! 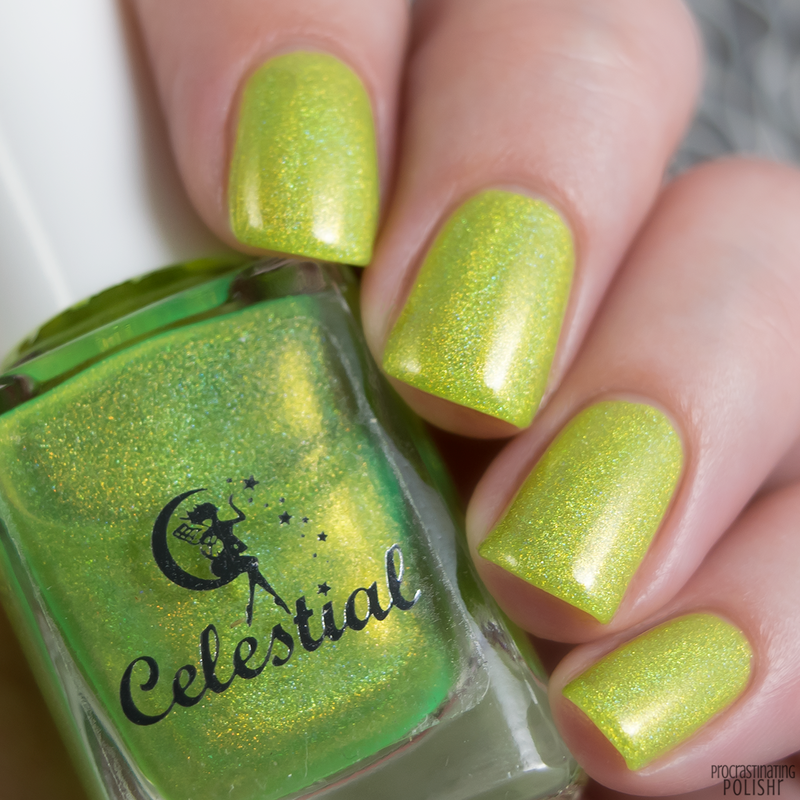 I didn't even know neon chartreuse was a thing, but here we are and it's magnificent. Strictly speaking, this is made with yellow neon pigment but there's some kind of magic that gives it that green edge. It's also incredibly, obnoxiously bright, so it ticks every box for me! Another great formula on this one - beautiful to apply and a great smooth finish. 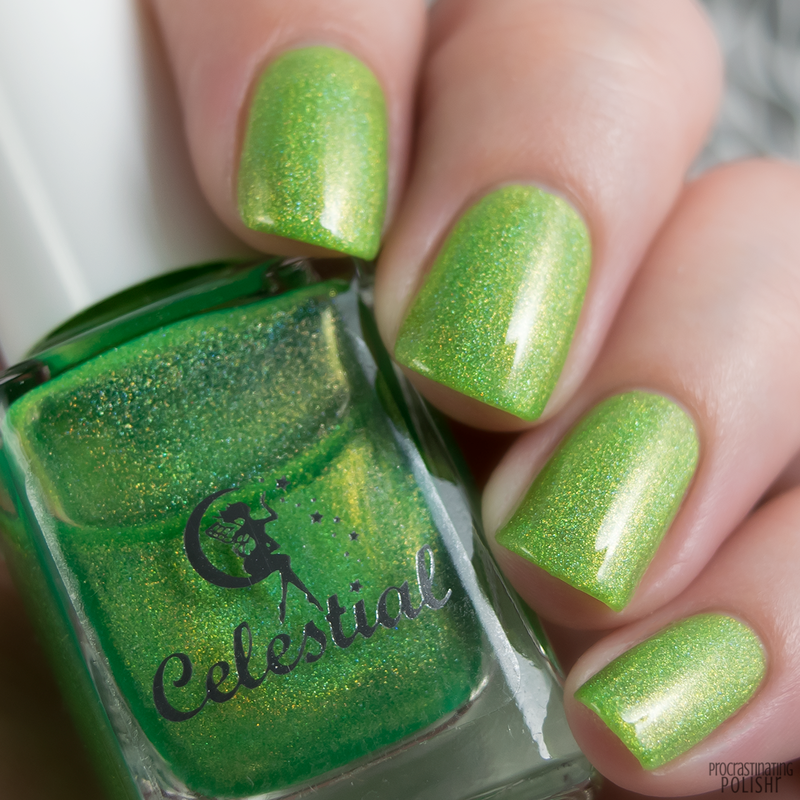 It's sheer at first but builds to a nice opacity in 3 coats. Super impressive for what's essentially a yellow jelly! 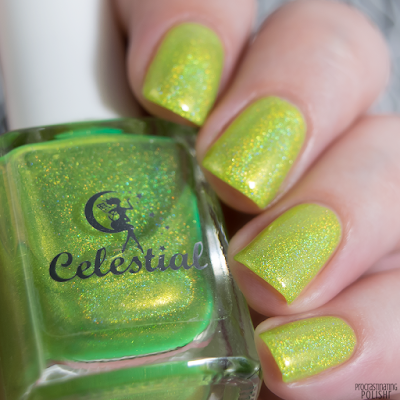 Neon green apple with a great scattered/linear holo. You definitely don't see many apple greens and I'm super into this bright neon version. 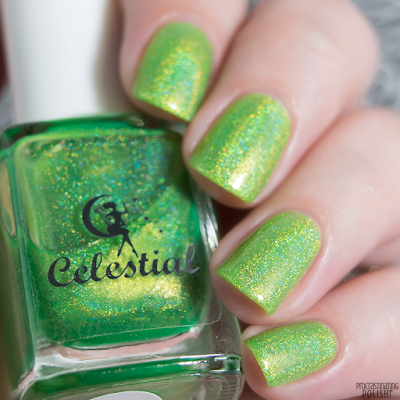 I didn't realise how much of a linear holo there was until I got it into direct light, but wow! In normal lighting it's got a bit of a yellow glow and a distinct scattered holo appearance. Another great formula - it's really impressive how consistent the formulas are across this collection. With the exception of Mind the Mullet they're all the same super viscous formula that are opaque in 3 coats. The Back to the 80s collection will be available from Celestial Cosmetics from 8am AWST, Saturday 20th January - find your timezone here!